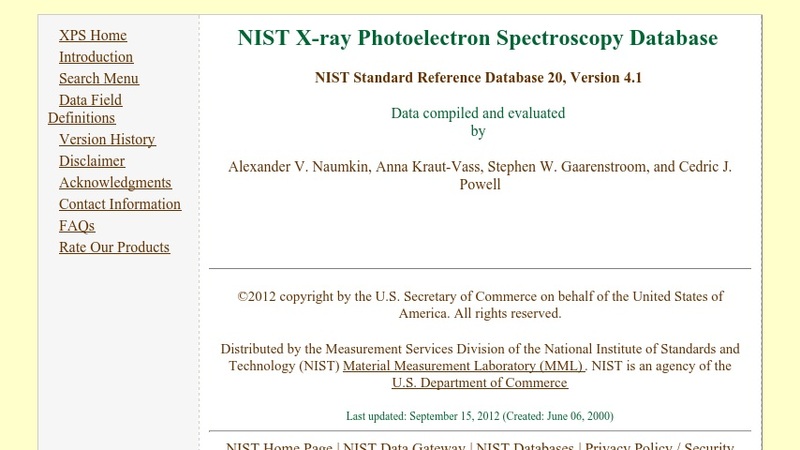 "The NIST X-ray Photoelectron Spectroscopy (XPS) Database gives easy access to the energies of many photoelectron and Auger-electron spectral lines." The website offers concise definitions of the data fields. Users can search the element data by binding energy, auger kinetic energy, auger parameter, doublet separation, chemical shift, or surface/interface core-level shift. The website allows users to retrieve data for groups of elements, an element in a compound, chemical name, and chemical classes. Individuals can also display spectral lines and wagner plots.